4th of July! Or are scallops appropriate? We are passing around the plague in our family. First Nathan was sick, and then Sarah, and after spending the day with Jonathan last Friday, he called to say he had a fever and sore throat. As an elder member of this family and someone who has notoriously bad lungs, I am waiting for the other shoe to drop. Obviously the family did not get together for the 4th of July! 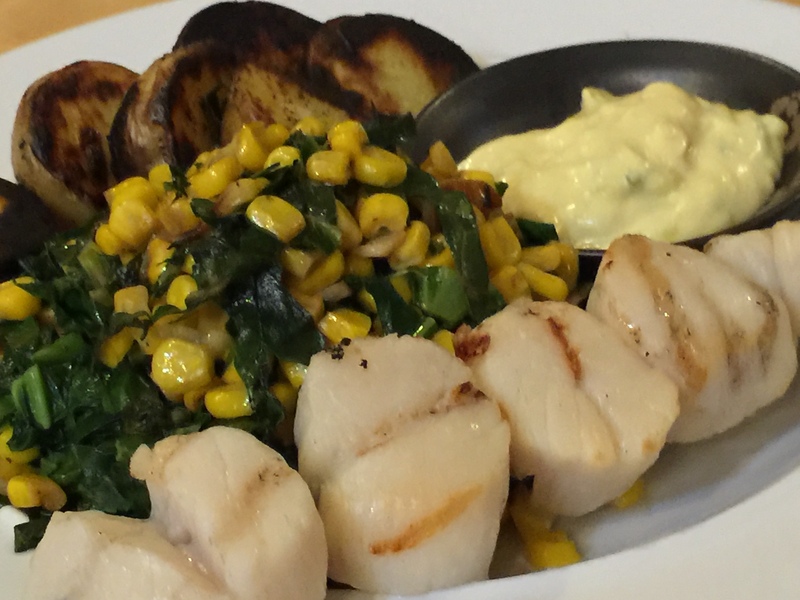 Since we have eaten a lot of meat lately we opted for scallops grilled on a skewer, grilled new potatoes, and chiffonaded collard greens with corn and garlic. I am thinking it doesn’t truly reflect my American hot dog and hamburger roots. Are scallops a patriotic food? It turned out okay but the scallops did not sear. I am afraid tripolyphosphate is the culprit. There was no mention of it on the frozen package but a white milky substance is what kept the scallops from searing. I woke up too early in the excitement of a holiday and did the NYTimes puzzle online. I need to be quiet and stealthy at 5 AM! The puzzle was pretty meh and the food references, “icees” and “torte” seemed like they were only there for their convenient letters. The Wall Street Journal did not have a puzzle since it only publishes on days when the NYSE is open. So it was slim pickins’ on the puzzle front. BTW, if you are interested in taking up crossword puzzles, Monday is the easiest day. The NYT charges for their puzzles and the WSJ does not. This entry was posted in pescatarian, Vegetables and tagged collard greens, corn, garlic, new potatoes, Pescatarian, scallops, Vegetables. Bookmark the permalink.